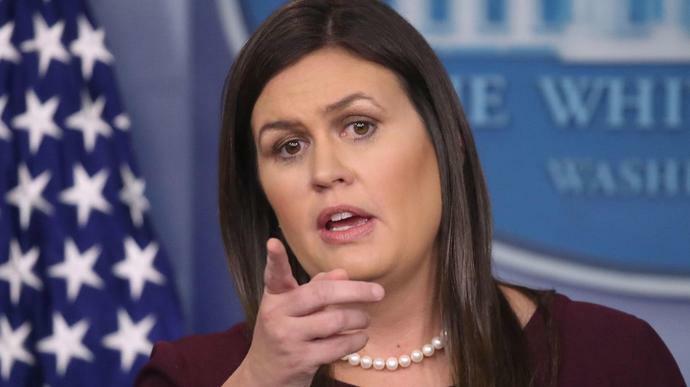 White House press secretary Sarah Huckabee Sanders on Tuesday admitted she made a mistake when she falsely stated that President Donald Trump tripled the number of jobs President Barack Obama created for black Americans. Sanders tweeted her correction hours after Tuesday's press briefing. "When President Obama left after eight years in office - eight years in office - he had only created 195,000 jobs for African-Americans," Sanders told reporters during the press briefing. "President Trump in his first year and a half has already tripled what President Obama did in eight years." Obama had actually increased employment for black Americans by about 3 million jobs during his time in office, January 2009 to January 2017, according to the Bureau of Labor Statistics. Sanders issued a rare apology for the inaccurate statistic late Tuesday, but quickly followed it up with a non-apology: "I'm sorry for the mistake, but no apologies for the 700,000 jobs for African Americans created under President Trump." The White House Council of Economic Advisers took responsibility for the flub and apologized to Sanders for an "earlier miscommunication." Sanders made the claim while responding to questions about whether Americans could be guaranteed that they would never hear a recording of Trump saying the N-word, as former White House aide Omarosa Manigault Newman has suggested he has. The press secretary replied by saying she "can't guarantee," then shifted the conversation to highlight Trump's employment record. "This president, since he took office, in the year and a half that he's been here, has created 700,000 new jobs for African-Americans," Huckabee Sanders said. "That's 700,000 African-Americans that are working now that weren't working when this president took place." After the press briefing, the Council of Economic Advisers tweeted data comparing increases and decreases in minority employment from the 20 months following Obama's election and the 20 months following Trump's election. The selected dates take into account any employment changes that occurred in the two months before Obama's and Trump's inauguration dates. "If you start the clock on Election Day, Trump's first 20 months slightly outperformed the beginning of Obama's second term in African American employment growth," Ernie Tedeschi, an economist who served under the Obama administration, told The Washington Post on Tuesday. "If you start the clock on Inauguration Day, Obama was slightly ahead. But the real bottom line is that the pace of jobs growth hasn't changed dramatically between the two presidents." As The New York Times noted, Obama took office during the Great Recession, when the employment rate for black Americans was 12.7 percent. According to the Bureau of Labor Statistics, that rate increased to 16.8 in March 2010 but fell to 7.8 percent by Obama's last month in office in January 2017. The unemployment rate for black Americans was at 6.6 percent in July 2018.